Race fans got all they could ask for in an exciting finish for the 100th anniversary of the Indy 500 on Sunday when JR Hildebrand crashed into the wall at the final turn of the race. Then Dan Wheldon came from behind him to take the checkered flag and claim victory in the ever important race. The 23 year old rookie, Hildebrand had been employing a fuel saving strategy in the final laps of the race and that strategy came to bite him in the end as he saw Wheldon coming up behind him. Hildebrand was able to cross the finish line despite the crash, however he couldn’t claim the prize. Hildebrand said after the race, “I knew we were really tight on fuel coming to the end, and the spotters were in my ear saying, ‘The guys are coming and they’re coming hard,’. Now he’ll need to get the car up on a Car Lift for a few major repairs. Dan Wheldon from Bryan Herta Autosport, who also won in 2005, was competing in his first race of the season. He was runner up the two previous years and was more than happy to complete for the win. Other notable finishing positions were Graham Rahal, who finished 3rd, Tony Kanaan who placed 4th, Marco Andretti who finished ninth and Danica Patrick who finished tenth. Dixon, who won in 2008, finished 5th. What an exciting finish for the 100th anniversary of the Indy 500. We can’t wait until next year. For those folks who need to lift the really heavy trucks – this lift is for you. If you need to lift fire apparatus, semi trucks, a bus, or anything heavy, the BendPak PCL-16HD Portable Column Lift was made for your application. They have a capacity of 16,000 lbs. each, and typically are sold in sets of four or six. The benefits of a portable column lifting system over a four post lift is the heavier lifting capacity and of course the portability. Plus they don’t have to be permanently mounted. You can roll these out when you need them, and roll them back into the corner when you are done with them. They have a pallet jack type design when it comes to engaging the wheels for the portability feature. They have forks to place under each wheel for lifting purposes, and are powered by and electric motor, which powers a hydraulic pump. They are synchronized to assure steady, even lifting. The set of six requires three phase power due to the high power demand needed. You can get single phase for the set of four, but it requires a dedicated 90 amp circuit, which is tough to come by, so you may need to go with the 3 phase power one again. There are heavy duty tall jack stands available as an accessory that also have a 16,000 pound capacity as well. 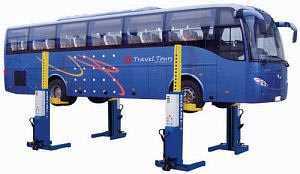 And because they are made by BendPak, you know these Auto Lifts are premium quality. The major auto makers from Asia, Europe and US are all currently manufacturing cars specifically for the Chinese market. They are introducing many new cars that cater to the more affordable market. The auto makers want a foothold in this potentially huge market so much that they are willing to take sacrifice intellectual property rights. These car makers are willing to make these concessions because they see huge potential for this market in the future and are partnering up with some large Chinese companies to produce affordable, low frills cars that meet Chinese consumers needs for a low budget car that offer a basic, entry level car. China consumers are beginning to prosper more than they ever have in the past and are reaping the rewards of a more capitalist society. One of the first things they purchase once they have the funds is an automobile. A car means some degree of independence and the ability to travel for employment or for recreational purposes is becoming more prominent throughout the more populated areas of this growing country. This could lead to a potentially large increase in the sales of automotive equipment in this large market, such as Car Lifts, Floor Jacks, engine hoists and tire changers. General Motors is jumping into the market with an affordable vehicle. So are VW, Toyota, Nissan, Honda and most other manufacturers. These cars will not be sold in other countries, at least for now. The Chinese Government has imposed strict rules that require these outside auto makers to follow onerous guidelines in order to be able to sell in the country. This means no proprietary technology. They must share their technology with their Chinese counterparts. With over a billion in population, one major side effect could be large traffic jams that are prominent in other major cities throughout the USA and other developed nations. You may have seen our previous post of another Bahamas connection earlier. We recently stopped by another one of our loyal customer’s auto shop on the beautiful Island of Nassau in the Bahamas. Rene Telle from Telle Auto has been servicing vehicles for decades and opened his specialty auto shop about four years ago. He specializes in German cars, especially Mercedes – Benz cars. In those four years, he has purchased quite a lot of equipment from us, including two of our BendPak XPR-10 Two Post Lift, a BelAire air compressor, and some pieces of Ranger shop equipment, like a press and oil drain. Rene says, “I am more than satisfied with my relationship with ASEdeals. I’m very happy with every purchase I’ve made. I will continue to go to ASEdeals.com for all my shop equipment needs”. Be sure to stop by and see Rene if you’re on the island. At a time when many major auto manufacturers have made deals with Chinese car manufacturing companies, SAAB has announced that it has severed it’s relationship with Chinese manufacturer Hawtai Motor Co. This deal was originally intended to prop up the struggling SAAB, giving them an entry into an untapped, potentially large and lucrative market in one of the world’s fastest growing economies, as well as providing some much needed financial backing. SAAB can now search for other potential partners in this vast economy, but it still is a significant setback in their desire to raise capital to help in their worldwide venture. SAAB was counting on this money to help keep their finances in order, and this setback severely impacts their financial future. Other major car manufacturers are already in cahoots with other China manufacturers to offer affordable, no frills cars to the vast Asian market. GM and Honda already have deals that offer cars that will not be sold in any other markets other than China for now. This could change at some point in the future as the Chinese market matures and quality rises. Many Car Lift and automotive equipment manufacturers have also moved much of their manufacturing to China, in an attempt to decrease labor costs to remain competitive. It’s a trend that’s sure to continue well into the future. Any technician worth his salt has a tool box of some kind. The longer you’ve been in the business, the more tools you accumulate, and therefore, the larger the box you need. Tool boxes and tool cabinets become a bragging point for some technicians as they tend to get larger and more involved as they gain time on the job. We’ve seen some pretty impressive boxes with custom paint jobs. You can get the top box first with matching bottom cabinet. Then a few years later you might add a side cabinet. There are other accessories like storage lockers and shelves available. When you want the ultimate tool box set up, you need to go to the right manufacturer. Waterloo has been making tool boxes, tool carts and chests for decades and is one of the premier manufactures in the industry. They have a wide selection of boxes to choose from with different lines that offer different levels of quality and features to fit any need. There are several key things to look for in any tool box you get. There are professional tool boxes and there are consumer tool boxes. Be sure to get a box that meets your needs. For the professional, probably the most important feature is ball bearing drawer slides. You need drawers to slide smoothly. The box should also be rated to have at least a 1200 lb. load capacity. Many inferior boxes are flimsy and won’t hold up to typical shop abuse. Drawers should be rated to hold 75 lbs. each. The wheels should be on ball bearing swivel casters. The box needs to have double wall construction at a minimum. Warranty should be at least five years. You should also get a line that allows you to exapand as you grow. Our Waterloo Tool Box has several professional lines that fit these requirements. Don’t short change yourself or you may end up needing to buy a new box a few years later. You are currently browsing the Car Lift Blog blog archives for May, 2011.